New research finds there's no escaping ocean plastic. Part of the UK’s Pitcairn Islands territory, the island is so remote that it’s only visited every five to ten years for research purposes, but its location near the centre of the South Pacific Gyre ocean current makes it a focal point for debris carried from South America or deposited by fishing boats. During the most recent scientific expedition to the island led by the British nature conservation charity RSPB, the study’s lead author, Institute for Marine and Antarctic Studies (IMAS) researcher Dr Jennifer Lavers, found the beaches littered by up to 671 items per square metre, the highest density ever recorded. “What’s happened on Henderson Island shows there’s no escaping plastic pollution even in the most distant parts of our oceans,” Dr Lavers said. 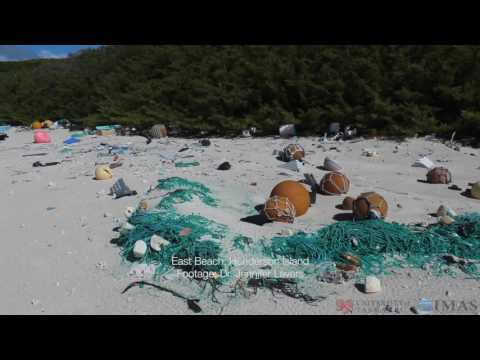 Far from being the pristine ‘deserted island’ that people might imagine of such a remote place, Henderson Island is a shocking but typical example of how plastic debris is affecting the environment on a global scale. Plastic debris is an entanglement and ingestion hazard for many species, creates a physical barrier on beaches to animals such as sea turtles, and lowers the diversity of shoreline invertebrates. “Research has shown that more than 200 species are known to be at risk from eating plastic, and 55 per cent of the world’s seabirds, including two species found on Henderson Island, are at risk from marine debris,” Dr Lavers said. Interested in conducting your own research? Find out about our research degrees. From Tassie to London, Fine Arts graduate Brodie Neill has the world at his feet.